Two stand-out performances from John Lithgow and Alfred Molina illuminate Love Is Strange (2014), the new film from Keep the Lights On (2012) director Ira Sachs. Like 2013’s comparable Chilean offering Gloria, it’s the story of love in an older generation and just as moving. Lithgow and Molina play Ben and George, two Manhattanites who take advantage of changes to the law and get married after 39 years together in Central Park. However, soon after their honeymoon, George is abruptly fired from his position as a music teacher at a Catholic school after its conservative headmaster worries over public perceptions of his recent marriage. The couple lose their apartment and have to separate as a temporary measure as they look for a new place within the Big Apple. Ben moves in with his nephew’s family, a fortysomething couple played by Marisa Tomei and Darren Burrows, while George sleeps on the couch of two gay policemen who live on the block. Meanwhile, Ben – the sensitive older man of the marriage – discovers a family going through a minor crisis of its own. Elliot (Burrows) is a workaholic husband who may or may not be having an affair, and Tomei’s Kate is frustrated with her stay-at-home writer’s life, perpetually having trouble working while Ben lounges around. What’s more, her sulky son Joey (Charlie Tahan) barely says a word to his parents. Thus, Sachs and co-writer Mauricio Zacharias craft an immaculate love story. This is love at all different stages of the life cycle – and romantic cycle – from teenagers through to septuagenarians, and from relationships beginning to their tragic conclusions. 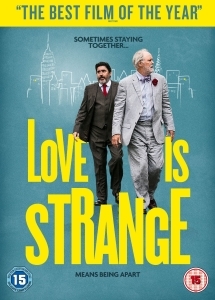 Love Is Strange is refreshingly unconventional as a gay love story, calm and warm-hearted in its views of latter-age love, only occasionally lapsing into conventional homosexual stereotypes – George finds himself shacked up on a sofa surrounded by endless parties with macho gay men. Lithgow and Molina are terrific together, never failing to convince as a loving couple who’ve been together for decades. Even after 39 years, it still looks like they’re relationship is a developing one. At Ben and George’s wedding reception, Kate describes how years before her husband proposed after taking her for dinner with the couple to show her a loving relationship that would be an example to any heterosexual one. One sequence, when George reads out a letter about his firing he wrote to his pupils’ parents, could have been preachy, but Sachs plays it with just enough sensitivity for it to be a springboard to further conversations about sexual equality. This review was originally published in February 2014 as part of our coverage of the 64th Berlin Film Festival.